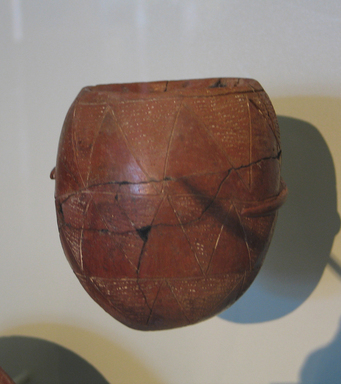 Red pottery jar, of ovoid shape, asymmetrical, with flattened base, the bottom perforated with a big hole. Slightly inset wide mouth without lip, the rim sharply splayed inward. Incised decoration, consisting of three irregular bands of inverted triangles filled with incised horizontal dotted lines. The last row of triangles forms a seven-pointed star with the base as a center. The white paste with which the incised lines were filled has been partly preserved. The rim is pierced with four holes for fastening cover. Condition: Broken and repaired. Numerous chips and holes, besides an artificial hole in the center of the bottom.